Yarr, the time has come to show the world that you’re not a landlubber. Today you shall set sail and search the lands far and wide to hunt for treasure, shiny gold or other valuables. As a pirate, life will be harsh. Salty water, dangerous skeletons, vicious creatures and others that want your booty aren’t an exception. If somehow the deadly conditions don’t end you, thou may become the legendary pirate that tales will be told about. Somewhere on an exotic location in the Caribbean seas lay many harbors where pirates come to visit. You play as a new buccaneer that needs to work its way up from unknown rover to legendary pirate. If you’re planning to go there it is important to build up some decent reputation with the folks. A real story is absent for the game, there is only progression through the ranks of quest givers and since this is a game that is quick to pick up and play on an online platform the story is not missed. However some quests do come with many riddles or a short background that gives the sense of a real tale. The first thing you notice are the cartoonish cel-shaded graphics that fit perfectly with the humorous setting of this game. What you notice really quickly is the amazing attention for detail that the developers have put into creating this world. Daytime is very sunny and slowly it turns into the night which is calming and crystal clear. Weather has effects on visibility and a sneaky raider knows to be stealthy by turning off the lights when setting sail in the darkness. Since most of the time you will be on your boat sailing the waters it is crucial that these places are nicely made. The sea looks so lifelike that it’s if you were really there, it moves around so organically and when it storms the deck will get soaked and the lowest bay will slowly fill, with the uttermost realism. The Sloop or Galleon will show signs of wear and tear with impact holes tearing through the woodwork. Fixing her up with planks may look comical on the inside, from the outside everything is patched with the battle scars showing it. Sadly your boat is reset every time you log in, but this also happens when it finally sinks a slow death. Another way of showing what kind of pirate you are is with the many aesthetical upgrades you can purchase in-game with your hard-earned doubloons from the different stores. Four main types of styles are present. Admiral is a highly respected captain while Sea dog is the warrior of the waters. If you are rather one of the wealthy pirates Sovereign is the one for you. Bilge Rat on the other hand consists of using the old scrap from others. As it says these are pure cosmetic and will not alter the use of said item. You can select from four main themes and others are unlocked by leveling at a quest giver. What are pirates known for? Yes, their great taste in music and nothing is different in Sea of Thieves. Grab your instrument of choice and start playing one of a few songs. Friends can immediately pick up and join the concert. Some alcohol will surely lubricate the pipes and loosen up those fingers, causing hilarious drunken ballads. A little absent is the background music while on a ship, you are surrounded by the waves, winds and creaking noises of the wood. Characters are voiced in their own unique ways ensuring each encounter is special and throws a true pirate charm to you. Sound effects themselves are firm and each weapon sounds differently, the wind flaps in the sails and water gushes like you are truly there. 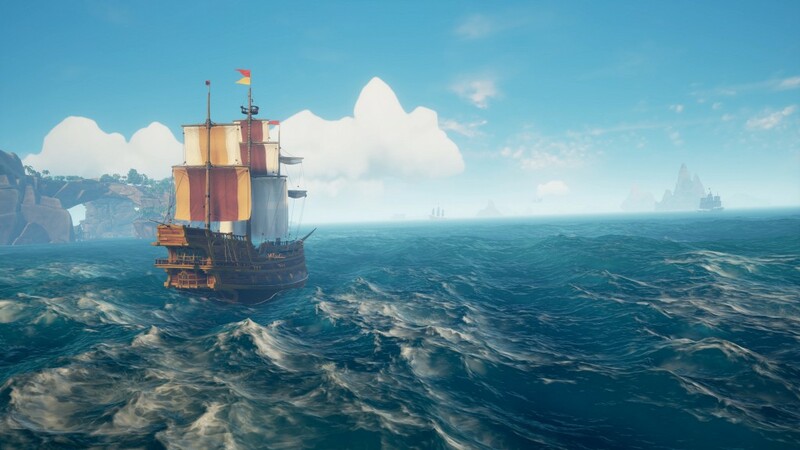 Sea of Thieves is an online multiplayer adventure game that puts you in the boots or sandals of a young pirate that one day wants to become a legendary pirate. At the beginning you select a character from an endless number of presets and the adventure commences. Now it is time to select what kind of barge is fit for the moment. A sloop is nimble and ideal for a two-man crew, while a galleon is a large battleship with ornaments fit for naval warfare. The boat will be located at the pier of an outpost you randomly spawn to. At these settlements there are many things to do like going to the pub and have a drink, getting quests from one of the three factions, tricking out your boat or pirate with new cosmetic items and scavenging for supplies. When the barrels are full and the adventure can start it is essential to decide what to do. The Merchant Alliance wants specific animals such as chickens, pigs and snakes to be captured. A more mystical Order of Souls is there to take care of evil undead pirates that need their skulls to be returned in order to bring peace. And if you care for the real treasure hunt the Gold Hoarders are there for the take. Since rovers are democratic it is needed to propose and vote on a voyage of your liking, it is only then that it will all begin. Work together and use a map and compass to set sail to the island you search, adjust the sails in length and angle to get the most wind in them and use the anchor wisely so you don’t scrape the hull in shallow areas. Completing these voyages will increase your pirate level, unlocking cool items and titles but also contracts that pay way better. One day you shall become the legendary pirate. Back in the days the pioneers of naval combat may not have had the most modern of tools, but no medieval situations as well. Each boat is equipped with cannons and a pirate can hold two weapons ranging from a cutlass and pistol to blunderbuss and sniper. It makes the game very enjoyable to fight like this instead of either having nothing or getting to play with the latest firepower. The inventory of a raider is always richly filled with items such as a compass, water bucket to stop the boat from sinking, a tankard for getting drunk on the go and a lamp because nighttimes are dark. This all might sound like a lot but you get away with the controls very quickly. The first ten minutes are a little hectic because of the many steps you must remember, having a good crew that knows their way around in each role ensures for a ship that will conquer the wild waters. Since its release the game does still have some quirky bugs but none that really hurt gameplay that bad, more some visual glitches or bugged animations. 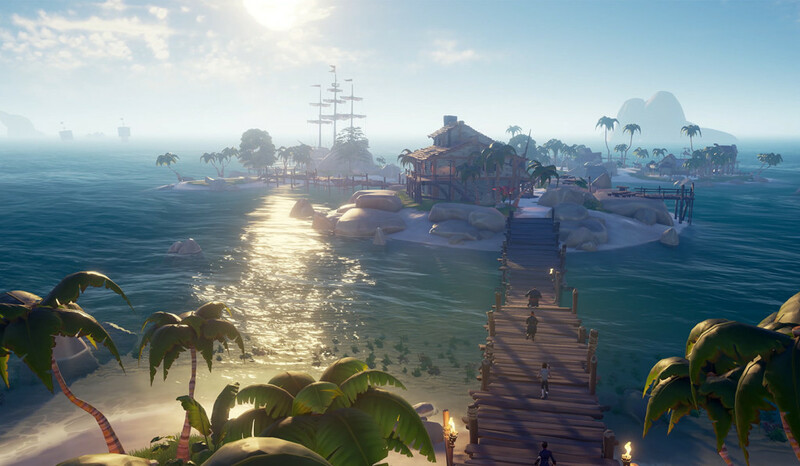 Sea of Thieves might not be received very well on some platforms but people forget that this game is just cheer fun, while it does have some bugs present, the amazing gameplay and laughable moments you will have are worth the while. 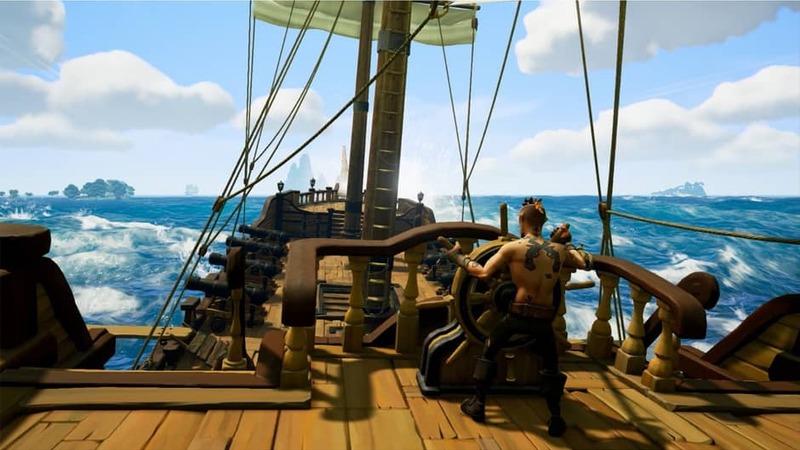 It is understandable that because of the hefty price tag critics are harsher on it, but Rare is a great developer and actually listensto the community. Pirate games are pretty rare and the other little experience we had was with Assassins Creed Black Flag. 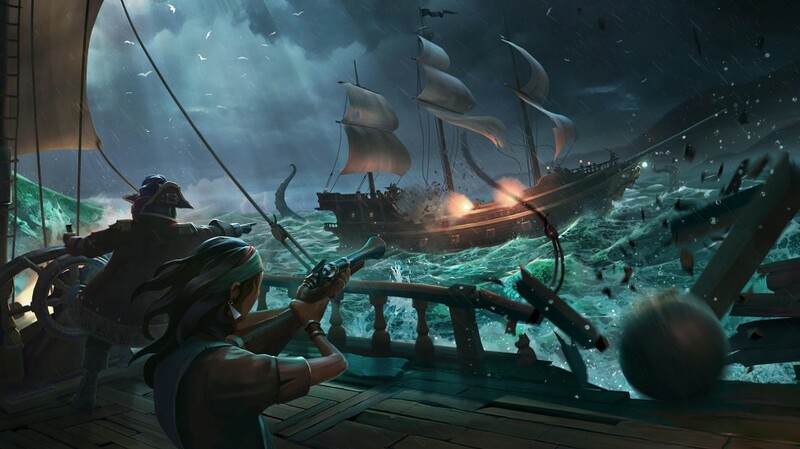 So Sea of Thieves is a welcome addition to the game library and what is more fun than setting sail, sinking ships, getting drunk and killing skeletons?